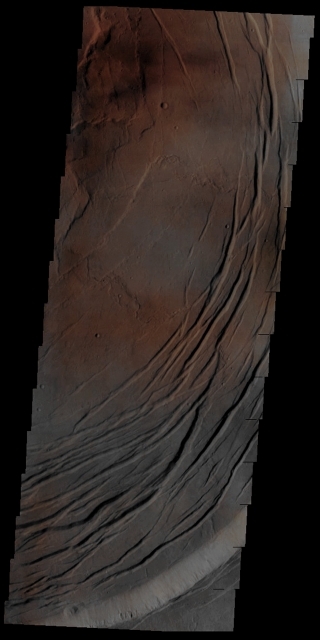 In this really and highly suggestive VIS image, taken by the NASA - Mars Odyssey Orbiter on July, 14th, 2002, and during its 2.576th orbit around the Red Planet, we can see a small portion of the Summit Caldera of the Gigantic Volcano known as Olympus Mons: the tallest Mountain in the whole Solar System. As NASA (in our opinion, as IPF, correctly) suggests, some of the slightest color variations that can be sen in this Absolute Natural Colors frame, might have been caused by the presence of extremely thin Water-Ice Clouds hanging over the Summit of the Volcano. The dark striations visible on the very top left (Sx) of the picture, could likely be shadows projected by the aforementioned Water-Ice Clouds. This image (which is an Original Mars Odyssey Orbiter false colors and Map-Projected frame published on the NASA - Planetary Photojournal with the ID n. PIA 19005) has been additionally processed, magnified to aid the visibility of the details, contrast enhanced and sharpened, Gamma corrected and then re-colorized in Absolute Natural Colors (such as the colors that a normal human eye would actually perceive if someone were onboard the NASA - Mars Odyssey Orbiter and then looked down, towards the Surface of Mars), by using an original technique created - and, in time, dramatically improved - by the Lunar Explorer Italia Team.